Isaac Cronkhite, who was appointed acting chief human resources officer last week, addresses a National Postal Forum audience in 2018. Isaac Cronkhite has been appointed acting chief human resources officer, where he will lead all aspects of workforce management and development for the Postal Service. He’ll oversee labor relations, employee resource management, leadership and career development, compensation and benefits, the HERO platform, the Human Resources Shared Service Center and the Employee Assistance Program, among other responsibilities. Postmaster General Megan J. Brennan announced Cronkhite’s appointment in a memo last week. “Isaac is a transformational leader, highly focused on enabling, empowering, and developing the men and women of our workforce. 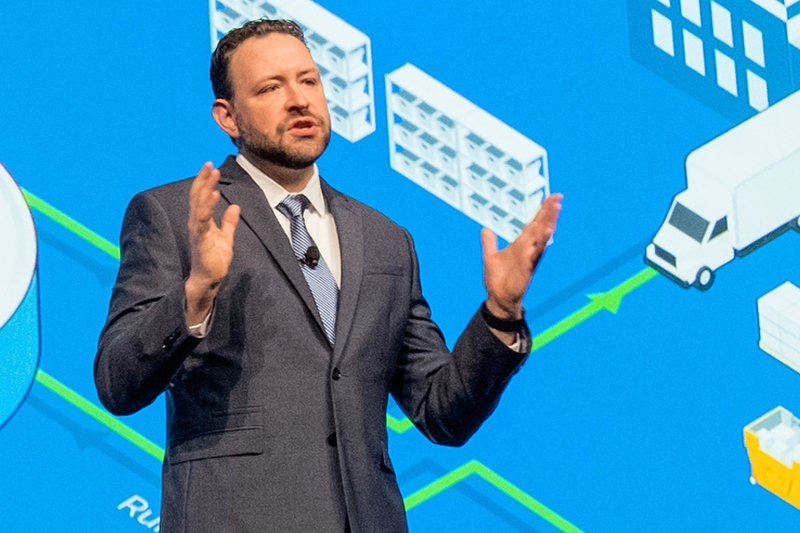 Throughout his career, he has been at the forefront of organizational efforts to better leverage technology, data, and business insights to enhance performance and unlock the potential of our people,” Brennan wrote. Cronkhite previously served as enterprise analytics vice president, where he led the implementation of the Internal Service Performance Measurement (SPM) system, advanced capabilities to provide real-time information to postal customers, deployed analytic tools across the organization, and launched Analytics University, which provides highly effective training to more than 29,000 frontline supervisors and managers. Other assignments included processing operations manager in Washington, DC; senior plant manager in Richmond, VA; and plant manager in Brockton, MA. He began his postal career as an industrial engineer trainee. Cronkhite’s new appointment took effect Jan. 19. He succeeds Jeff Williamson, who recently left the chief human resource officer role to return to the private sector. Jeff Johnson, who most recently served as information technology vice president, has been named enterprise analytics acting vice president. Pritha Mehra is now serving as information technology acting vice president, while Marc McCrery has been named to Mehra’s former role — mail entry and payment technology vice president — on an acting basis. McCrery previously served as delivery retail and technology director. This entry was posted in General Union Business and tagged acting chief human resources officer, compensation and benefits, Employee Assistance Program, Employee Resource Management, HERO platform, HRSSC, Human Resources Shared Service Center, Isaac Cronkhite, Labor Relations, leadership and career development. Bookmark the permalink.